According to recent estimates, diabetic neuropathy accounts for about $50 billion in both direct and indirect costs associated with diabetes in the United States. “Diabetic neuropathy is one of the most common microvascular complications of diabetes,” says Cecilia C. Low Wang, MD, FACP. “It’s associated with major morbidity and can significantly reduce quality of life for patients.” Diabetic neuropathy occurs in about 60% of patients with diabetes at some point during their lifetime and is more common in those living with diabetes for a number of years. The condition is characterized by impairment of peripheral nerve axons, particularly in the limbs. Diabetic neuropathy often results from chronic hyperglycemia, regardless of the type of diabetes. There are several different types of neuropathy that patients with diabetes may experience, but the most common forms are distal symmetric or sensorimotor diabetic peripheral neuropathy (DPN) and autonomic neuropathy. With DPN, patients typically describe their symptoms as tingling, pain, numbness, or weakness that starts out in the feet and progresses to the hands at a much later stage. With autonomic neuropathy, orthostatic hypotension, blood pressure dysregulation, urinary retention, erectile dysfunction, and gastroparesis are among the clinical consequences of autonomic dysfunction. There can also be significant hypoglycemia unawareness. “Early recognition and appropriate management of neuropathy in patients with diabetes are important,” says Dr. Low Wang. She notes that a number of treatment options are available for symptoms of DPN but adds that these therapies do not treat the underlying mechanisms of the disease. The American Diabetes Association notes that up to 50% of DPN cases may be asymptomatic. These patients are at risk for insensate injuries to their feet. “Patients with diabetes should be screened annually for diabetic neuropathy,” says Dr. Low Wang (Table). “Typically, this requires combining more than one test to increase sensitivity for detecting DPN. This takes a little more time, but it’s an important part of diabetes care.” Loss of sensation to the 10 gram monofilament and reduced vibration perception can help predict the development of foot ulcers. Importantly, causes other than diabetes should be considered in patients with neuropathy, particularly when it is severe. Autonomic neuropathy—cardiovascular autonomic neuropathy, in particular—is independently associated with cardiovascular mortality. Specific treatments for underlying nerve damage are currently unavailable. “The optimal approach to management is to provide treatments that improve glycemic control,” Dr. Low Wang says. However, while this may prevent or slow progression, it will not reverse neuronal loss. Diabetic autonomic neuropathy has also been associated with genitourinary tract disturbances. Clinicians are recommended to evaluate bladder dysfunction for those with diabetes who have recurrent urinary tract infections, pyelonephritis, incontinence, or a palpable bladder. Effective symptomatic treatments are available for some manifestations of DPN and autonomic neuropathy (Figure). “The first step in managing patients with DPN should be to optimize glycemic control and avoid extreme blood glucose fluctuations,” says Dr. Low Wang. “Neuropathic symptoms can improve by optimizing glucose levels.” Several pharmacologic treatments may also be beneficial in patients with symptoms of painful DPN. Many agents have been examined in systematic reviews and meta-analyses of clinical trials, but only a couple of medications have received FDA approval for treatment of painful DPN. Treatments for autonomic neuropathy are different from those for DPN. For example, gastroparesis may improve with dietary changes and prokinetic agents. “The interventions used for patients with autonomic neuropathy depend on patients’ clinical signs and symptoms,” Dr. Low Wang says. These interventions can have a positive impact on quality of life. Singleton JR, Smith AG. 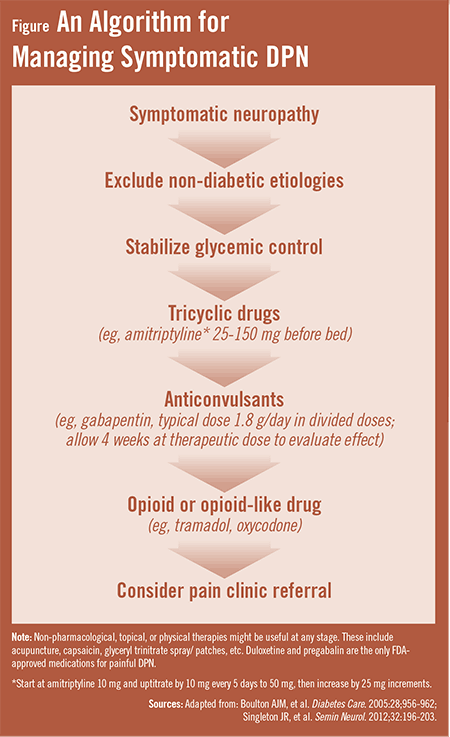 The diabetic neuropathies: practical and rational therapy. Semin Neurol. 2012;32:196-203. Callaghan BC, Hur J, Feldman EL. Diabetic neuropathy: one disease or two? Curr Opin Neurol. 2012;25:536-541. Boulton AJM, Vinik AI, Arezzo JC, et al. Diabetic neuropathies: a statement by the American Diabetes Association. Diabetes Care. 2005:28;956-962. Available at: http://care.diabetesjournals.org/content/28/4/956.long. Bril V, England J, Franklin GM, et al; American Academy of Neurology; American Association of Neuromuscular and Electrodiagnostic Medicine; American Academy of Physical Medicine and Rehabilitation. 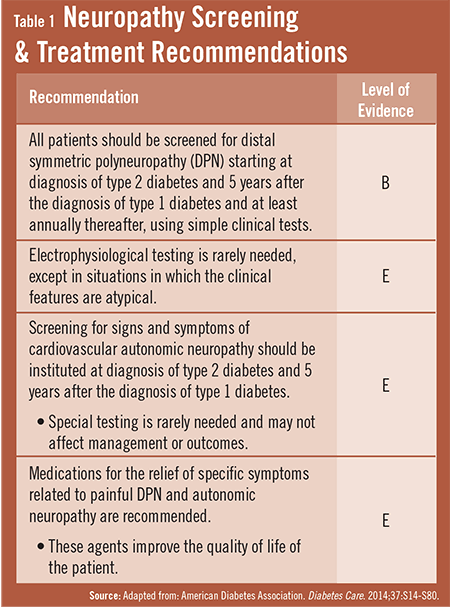 Evidence-based guideline: treatment of painful diabetic neuropathy: report of the American Academy of Neurology, the American Association of Neuromuscular and Electrodiagnostic Medicine, and the American Academy of Physical Medicine and Rehabilitation. Neurology. 2011;76:1758-1765. Cecilia C. Low Wang, MD, FACP, has indicated to Physician’s Weekly that she has received grants/research aid from the Department of Veterans Affairs and, in the past, has worked as a paid speaker for Merck.